The ability to start a fire is arguably the most important skill to have when camping, hiking or in a survival situation. Fire gives you the ability to boil water, cook food, provide warmth, signal for rescue, make tools, keep insects and predators at bay, and it also gives you a psychological boost. The cheapest and most obvious tools to have for fire starting are lighters and matches. I always have these two tools on hand but they do have their downfalls. They can break and if they become wet they are instantly unusable until they dry out. The number of times you can use them are also quite finite. For the reasons listed above most outdoorsmen carry flint rods and magnesium bars. Flint bars give a shower of sparks when scrapped with the edge of a metal tool. Magnesium bars give you a little extra boost when starting a fire. You scrape the magnesium bar which provides a small pile of magnesium dust or shavings. When sparks from the flint hit the magnesium pile it is ignited and produces a short burst of temperatures at around 3,000 degrees. I have used a lot of different flint rods and magnesium bars in my search for the perfect combination. There are two main issues that I have run into. The flint rod either doesn’t produce enough sparks or the sparks are very short lived. Most magnesium bars/rods that I have tried produce dust rather than shavings when scrapped. This pertains to the purity of the magnesium. The dust easily blows away and the energy it provides when ignited is very short lived. I believe I have finally found the best combination of flint and magnesium rod. The Survival Model made by Purefire Tactical is an outstanding piece of work. 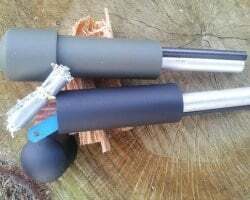 The flint and magnesium rod are stuck together and molded into a PVC handle. The connection of the rods into the handle is extremely tough and will not break. The handle is hollow so that you can add any extra gear you want even though it comes with two strikers, magnesium shavings on a duct tape roll and a piece of fat wood. What I really like about this striker system is the handle. It is quite large and there is space between the striker rod and where you are holding it. This will prove to be very beneficial in a cold weather situation. In that kind of environment your fingers may be numb or hands may be trembling. A run of the mill flint rod and striker are quite small and you have to be hunched over pinching the rod and striker with your fingers to be able to strike a small area for sparks. People with experience with flint rods will know what I am talking about. With this system one could be wearing bulky gloves and still have a comfortable hold on the striker handle and then use the back edge of a knife to obtain the sparks. The magnesium rod is incredibly pure. 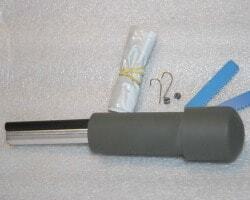 Purefire Tactical boasts a 99.6% purity of the magnesium rod. When I started using the scraper on the magnesium rod I fully believed their claim. Compared to all other magnesium blocks or rods I have used this magnesium rod is almost like butter it is so easy to scrape. I actually got curls of magnesium when I scrapped it instead of little pieces or dust. Another great thing I enjoy about this system is the hollow handle. As I previously stated the company adds some great extras into the handle when you order the fire starter. Obviously you don’t have to only use what they put in there and you can customize the contents to your liking. I will say that even with the items the company puts into the handle there is still space for you to add additional items. This system works so well that my five year old daughter was able to use it and start a fire with no problem. Again, with most fire starters they are small and don’t give off enough sparks. My daughter was able to hold this and easily scrap off magnesium and send a shower of sparks into our tinder bundle. The look on her face when she started the fire was more than enough reason for me to own this piece of equipment. Honestly, the only downside I found about this product was its size. Personally the size does not bother me but I can see how it might seem a bit bulky for some and take up more space in a pack than desired. To combat this possible downside for some, Purefire Tactical offers two other models that are smaller. A folder model and a keychain model. Both have the same great flint and magnesium rods, just in a smaller package. If you are a first time buyer or you have many flint rods (like me) I highly recommend checking out Bobby Linn at Purefiretactical.com and supporting his American made product. The Survival Fire Starter features a 5/8″ x 3″ rod of the purest magnesium available and a 30,000 strike flint.